When Historic Seattle invited Urban Sketchers Seattle to collaborate in presenting a sketching workshop, the partnership was a good fit. 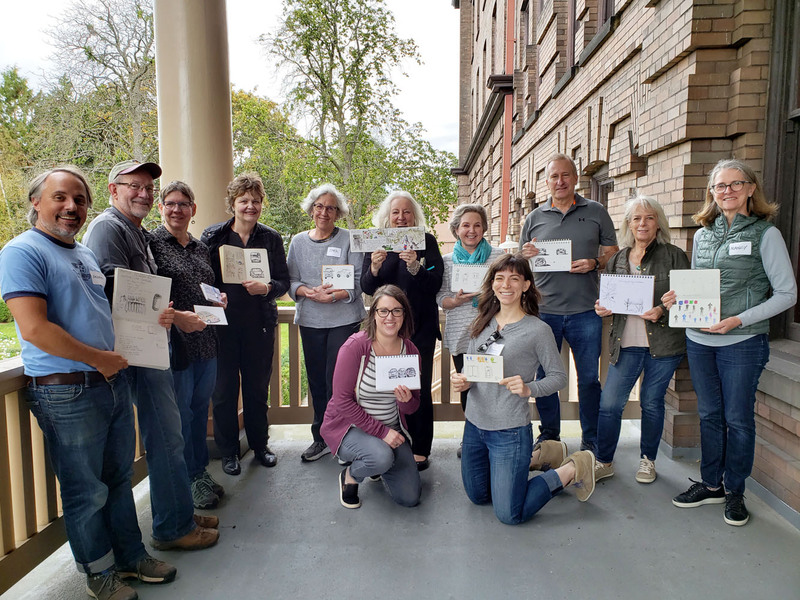 Members of Historic Seattle, a nonprofit organization committed to the preservation of Seattle’s historic landmarks, love old buildings just like sketchers do. 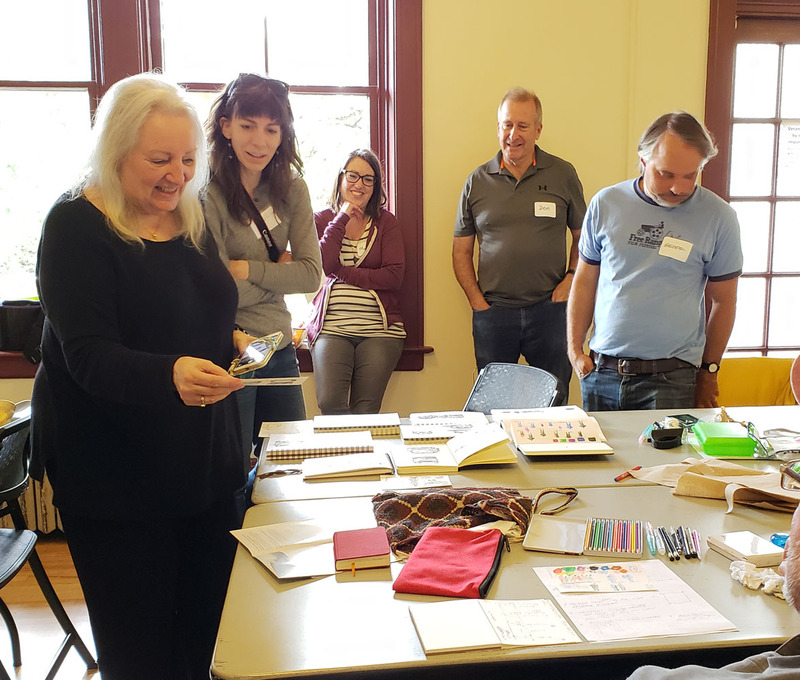 And Good Shepherd Center, the first project that Historic Seattle worked to save and then manage for community events, was an ideal location for Michele Cooper’s popular First Steps in Visual Journaling USk workshop. Michele’s students had a fun morning learning the basics of sketching. Then in the afternoon, an optional sketchcrawl at the Center and Meridian Park was an opportunity to introduce her students to an actual outing with the rest of us. The outing featured many sketchable attractions at Good Shepherd Center and Meridian Park, including the historic Seattle Landmark building itself, a playground, gazebo, sculptures and lots of shrouded apple trees protected from insects in this pesticide-free park. Once I arrived, however, I learned that the Great Wallingford Wurst Festival was just a couple of blocks away! 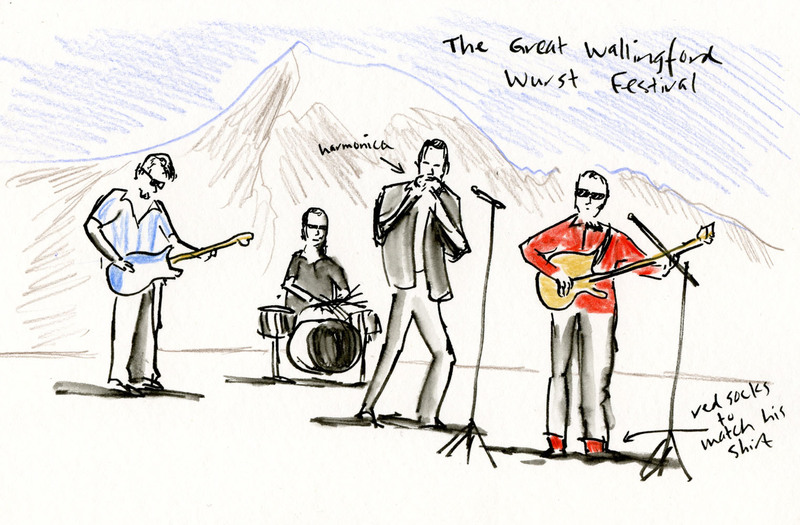 I’m not a fan of wurst, but I am a fan of small community festivals (especially “great” ones), so I couldn’t resist. 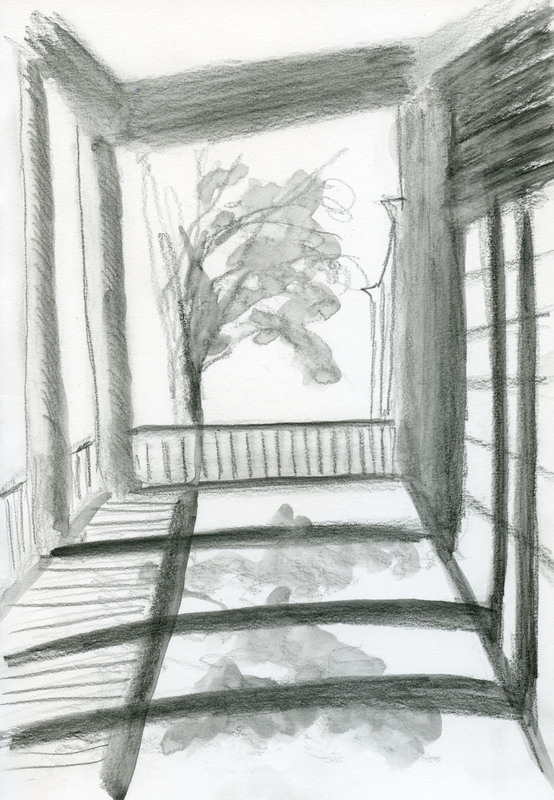 As Jane and I walked toward St. Benedictine School, where the wurst family event has been held annually for 35 years, the church’s tower called to me as an ideal exercise in graphite. I had my pencil and sketchbook out, ready to go, but then rockabilly music from the festival called to me even more loudly. Forget the tower – I had more fun sketching this group of lively musicians. After hanging out at the wurst fest longer than I had intended, watching kids win prizes at the flamingo toss and other sports, I hurried back to the Good Shepherd Center. With only 20 minutes until the throwdown, I went out to the back veranda, where the columns cast stripes of shadows in the late-afternoon sun. Many thanks to Historic Seattle for opening the Center to USk Seattle!